Buzz Kill Ramblings of Tim Louie: APPARENTLY, IT IS A SMALL WORLD AFTER ALL! Some might look at this story and think it's just silly, but the headline alone pulled me in and I think it's absolutely amazing! I'm just going to get right to it and you tell me what you think. 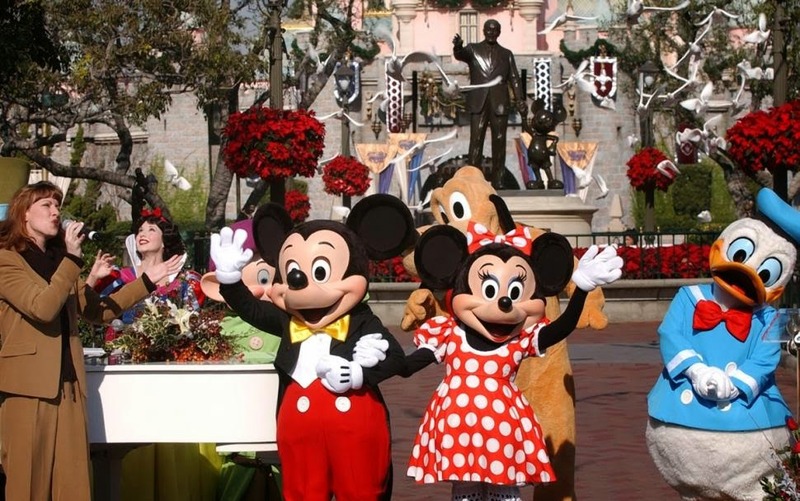 So, on Valentine's Day, two lovers, Michael and Diane Greening decided to visit three Disney theme parks in one day. Sounds impossible, right? Wrong! They did it! They started with the park in Tokyo then flew to Anaheim and finally ended up Orlando right before the park closed on Saturday. The trip was a 28 hour, 7,900-mile global jaunt to celebrate their love for one another at the "Happiest Place on Earth." 49-year-old Greening said, "It's completely insane and that's why we did it." 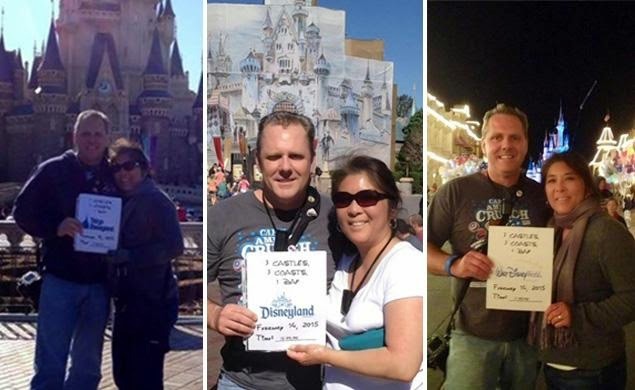 Greening has been hooked on Disney since he and his wife, Diane, celebrated their first wedding anniversary at the California amusement park. The childless (which really makes no difference) San Diego couple returns to the Anaheim amusement park every year to mark their big day with Mickey and Minnie. With their 17th Anniversary approaching this past January 17th, the Greenings considered shaking things up this year, but couldn't decide whether to hit the Tokyo Disneyland or the Walt Disney World in Orlando. Then Michael proposed doing both the same day with a stop in Disneyland in between. Michael knew it could be done, but only on days when the Magic Kingdom in Orlando was open until midnight. That ruled out January 17, but Valentine's Day could work if the air-transport Gods played along. The Greenings started at Tokyo Disneyland at 9:50 a.m. Saturday. They took a photo in front of the castle and got things in motion, catching a 10-hour flight to Los Angeles. Even though the plane was an hour late, the Greenings reached Disneyland just after noon, posed for a picture in front of the castle there (which seems to be under renovations) and raced to Orange County's John Wayne Airport. They got there just in time.....to miss their Orlando-bound flight. The air-transport Gods must have been watching because luckily for them, a U.S. Airways attendant booked them on another flight and they even made up 30 minutes of lost time. Greening said, "We were so lucky!" The Greenings posed for their final photo at Disney World on Main Street with the castle in the distance at 11:40 p.m., 20 minutes before the park closed. Yeah, the total travel time was nearly 28 hours, but they technically visited three Disney parks on Valentine's Day, because Tokyo is 14 hours behind Florida. See? It really is a small world after all. The "physically brutal" trip isn't for the faint of heart, but it was surely a Valentine's Day to remember for the Greenings and it would be for anyone for that matter. Michael said, "The best thing was doing it with my wife and my best friend. Having her by my side for the whole thing made it special." Disney officials did not comment on the stunt yet, but if I worked for Disney, I would be hooking this couple up with lifetime passes for any of their theme parks. Their story was amazing and their adventure can't be compared to anything else that I've heard in recent memory. Plus, who even thought it was even possible to do this? So? Stupid? Or pretty f'n amazing? I still choose the latter.